Here is the card I made using the Heart Doodle 5 image you can find it HERE. I colored with copics, added stickles to some of the hearts, glossy accents to others and some I left with just some color. I added some bling, ribbon, primas and brads, I also got out my old letter rub ons and used for the sentiment. 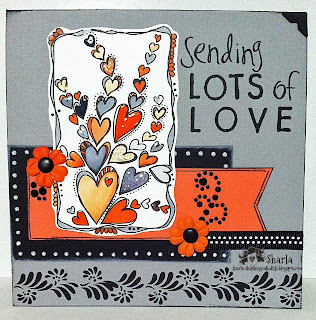 I hope you like my card and will join our challenge, Sandy also has a freebie available, so come check it out!! A beautiful design, loving the pop of colour against the monochromatic background. this is so great!!! i never would have used orange and grey together. they work so well! Love the digi you used! Great layout too! Thanks for joining us at Glitter n Sparkle - best of luck in the draw! This is really great! Love all those oranges! This is gorgeous!! I loveeeeee the colors and those hearts!!!! This is so perfect!! :o Love the colors!! Gorgeous!! Your coloring is awesome!! A very, very cool card with the perfect touch of orange in it. Great way to use one of the doodles too. Love the grey, black and orange colour combo. I've never seen those shades together but they look fantastic. This look fantastic I love how you got the rest of the card to match the image so well. 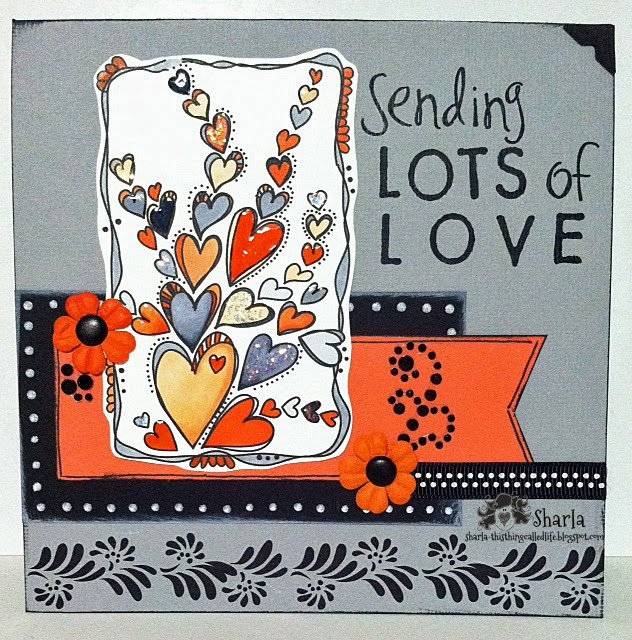 Love the colour combo the orange just make the card pop!